“The Old Mill Plaza” at Main and West Third streets, Newton – c. 1915 photo. Established in 1879. Shut down as a flour mill in 1964. Located on West Third Street, the flour mill was originally operated as the Monarch Steam Mill. In 1886, Bernard Warkentin, David Goerz, C.R. McLain, S. Lehman and Jacob Linn purchased the mill from D. Hamill and renamed it the Newton Milling and Elevator Company. It’s informal name has been “Warkentin’s Newton mill.” With a desire for extra wheat storage capacity, a new elevator was built in 1898 at East Sixth and Pine. This proved to be a wise move when the facility on East Third Street, the former Newton City Mills, burned in 1902. 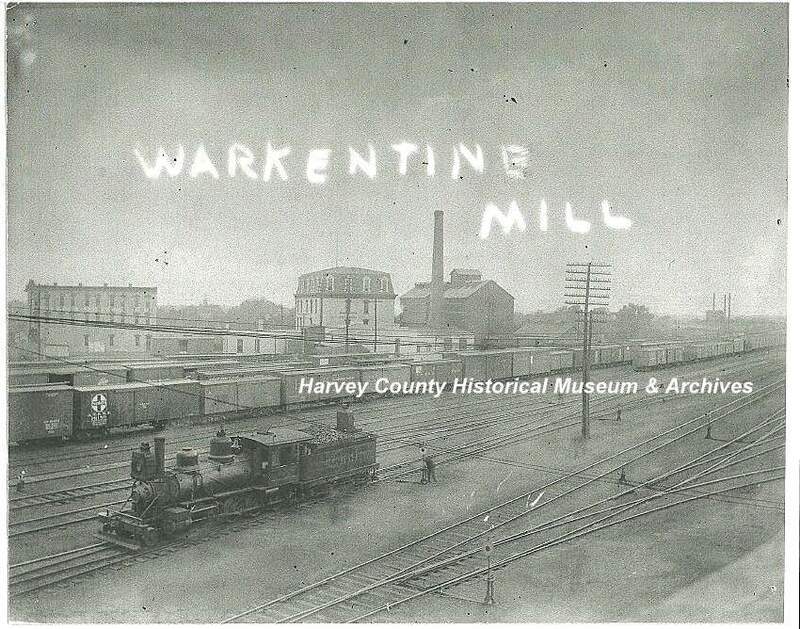 After a 1948 purchase, the International Milling Co. operated the “Warkentin” mill until 1964 when it was shut down. By the early 1970s, the vacant mill had fallen into major disrepair and was to be torn down. Lloyd Smith purchased and renovated it. The building transitioned from the housing of manufacturing businesses to office space. Portions of the original complex are now gone. Note 1: At the far left is the three-story Hotel Newton. Note 2: The photo’s caption incorrectly shows an “e” on the end of Warkentin. Photo Source: HCHM collection.